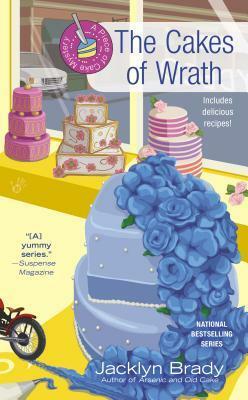 This is the 4th book in the A Piece of Cake Mystery series. Rita has inherited her husband’s cake business in New Orleans and is running it along with her mother-in-law, who has her own ideas about how things should go. The setting alone makes this a worth while series to read. I haven’t lived in New Orleans, but I have visited a couple times and loved it. In this outing in the series, Rita is suspected of the murder of a fellow business owner’s wife and has to work to clear herself since the police seem pretty sure she’s their “man”. The character of Rita is strong, independent (almost to a fault), and intelligent. It takes a forceful personality to survive in the catering/pastry business and Rita is built to thrive in it. The other recurring characters have shown growth and the relationships have developed through the course of the books. There is the introduction of some new characters this time and the notable absence of one of Rita’s love interests. I do like how the author is handling the dreaded “love triangle” in this series, it is a more mature, realistic approach. The mystery is well crafted and includes modern elements of drug addiction and rehabilitation, including NA. This gave the cozy a more up to date feel. This is a series that I always look forward to the next book. Highly recommended fun cozy mystery! This entry was posted in Book Reviews and tagged mystery, reviews.